Just recently there was a baby shower for a young mom expecting her second, a boy (He has since been born and is absolutely adorable!). I knew I wanted to make something but wasn’t sure what. 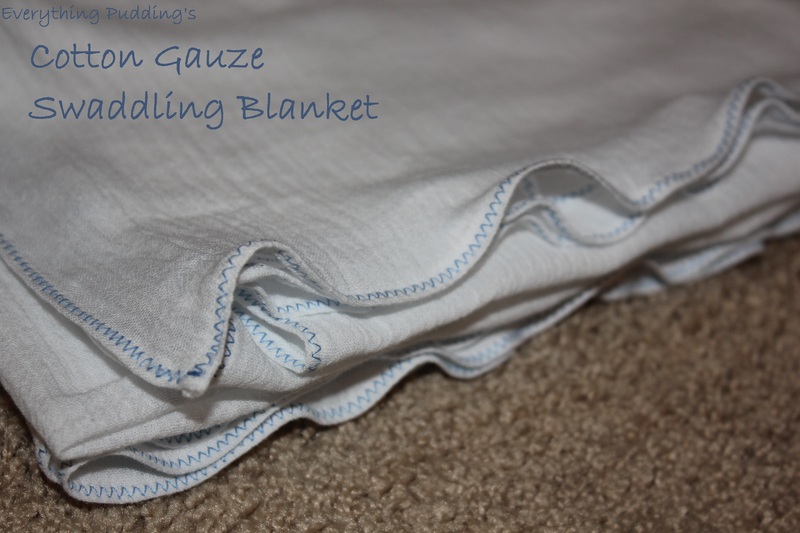 My mom suggested a cotton gauze swaddling blanket. I know they’re pretty expensive in store so I found a tutorial through pinterest and made one. 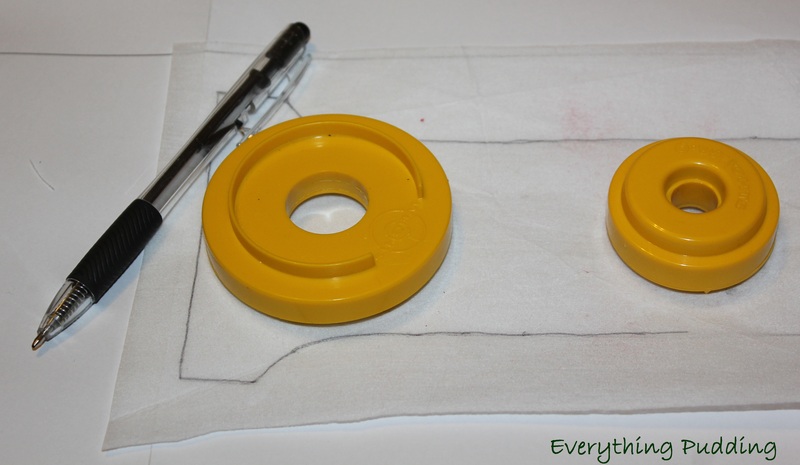 This tutorial from the blog MADE was extremely helpful. I ended up using Method 2 which I found pretty easy. I at first attempted to do mitered corners but that was difficult so I just ended up doing regular ones instead. Since I was using a white fabric I used blue thread in a zig-zag stitch to sew it in order to dress it up a little more. Sewing the edge seemed to make the edges stretch which created a slight ruffle effect on the edges. But I think that looked nice too. Fabric Note: JoAnns was the only store in my area that sold cotton gauze and they had a very small color selection (white, brown, and black, that’s it). I looked around online and found several stores that carry cotton gauze. Fabric.com has a good selection of cotton gauze and it is only $3.95/yd which is much better than JoAnns ($6.99/yd regular). If you want patterned fabric, Fashion Fabrics Club has lots of different patterned ones, though they are more expensive. All in all it was a super easy blanket to make and a lot less expensive than it’s bought counterpart. Another Note: Later my mom actually found these sets of four blankets in Costco for $20 a piece. Buying it that way ($5/blanket) means it isn’t worth it to us to make them. However since they tend to be expensive, unless you can find a deal like we did you’ll probably end up better off by making them. I’m getting down to the end of my Christmas Wrap-up posts. Only one more post (with a new tutorial) after this one. 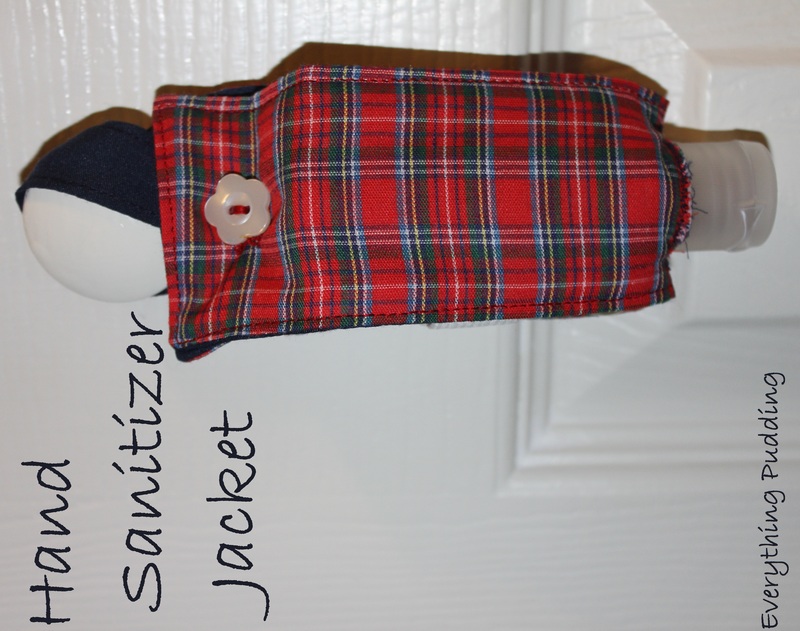 Today I’m sharing with you the hand sanitizer jacket I made based on a tutorial by The Inspired Wren which you can also download for free from Craftsy. 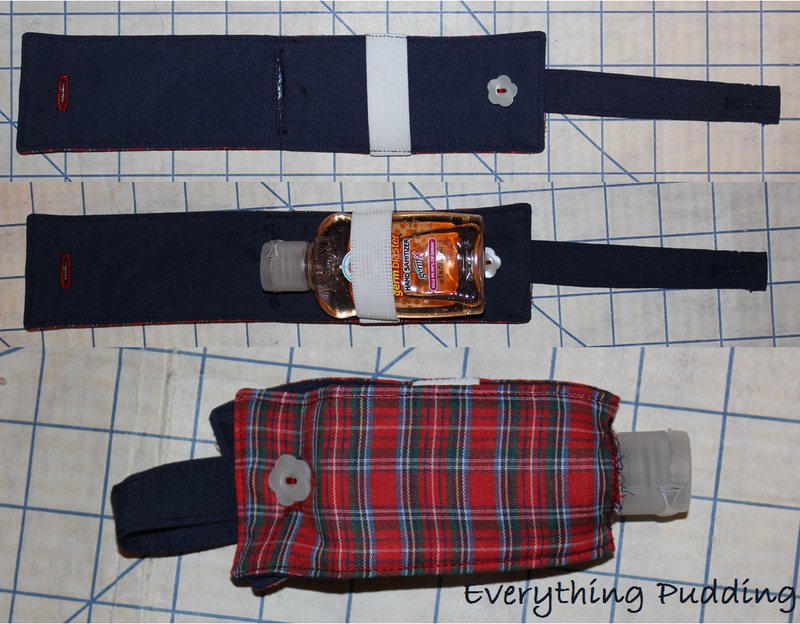 It’s a practical project and is also great for using up scraps. I’ve already got plans to make some more of these to use up some of my large remnant stash. The original tutorial called for a 2 oz. 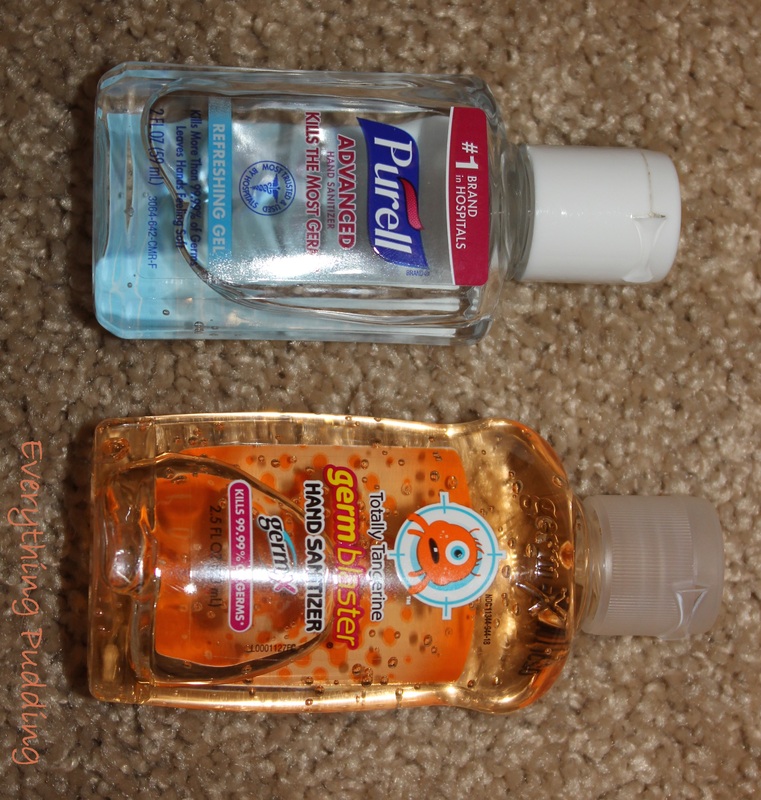 bottle of hand sanitizer. However, when I went to Walmart they only had 2.5 oz. bottles. You can see the difference in size between the one I got (on right) and a 2 oz. bottle my sister had. Because of the size difference I made my fabric pieces slightly bigger than called for in the tutorial. As mentioned above, the tutorial originally called for a handle made using elastic (specifically she used fold-over elastic). I really liked the look of the fold-over elastic used as a handle however decided not to do this because I didn’t have any on hand and because fold-over elastic stretches out really easily so being used as the handle for the jacket meant it would probably stretch out over time. Instead I used a piece of fabric. I’m sure you’re probably familiar with this way of making handles/straps, but I’ll just quickly brief you on the way I did mine. Fold piece of fabric in half, press. Unfold and fold both sides into the middle, press. Unfold and fold down 1/4″ on one end (so that you have a finished edge), fold along middle crease, and press. Sew all the way around to make one large rectangle (sewing the bottom edge isn’t necessary but I decided to do it anyway). Insert buttonhole following tutorial’s instructions. I did find that I had trouble doing the button hole because there was nothing which I could hold onto to “feed” it through my machine. It took me several tries but I finally figured out that I had to do the buttonhole slightly farther from the end than called for (it was still long enough and didn’t cause a problem) and I stuck pins into both side of the end of the piece so I could push the fabric through when it got caught while making the buttonhole. This project did take me longer than I thought it would. This was due to the fact that I used some different materials (required more time to figure out what to use and cut out fabric) and that I had to redo the two different buttonholes several times. But I finally finished it, it turned out well, and best of all the recipient, my little sister, really liked it. There are only two things that I plan on doing differently next time I make these. 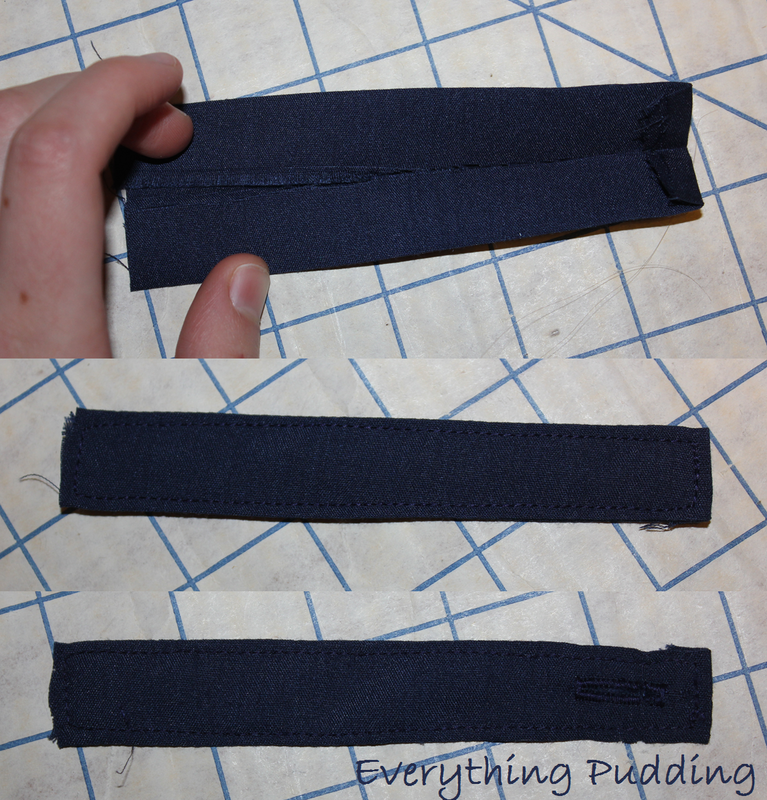 Use coordinating fold over elastic for the elastic belt (didn’t have any on hand, otherwise I would’ve used it originally). This project is great for using up little scraps, and once you’ve mastered the art of buttonholes, shouldn’t take you too much time. So grab some fabric from your stash, pick up the tutorial from The Inspired Wren on Craftsy, and start sewing! It’s taking me an awful long time to post about the different projects I made as Christmas gifts. But eventually I’ll get through them all, though you may still be seeing a Christmas Wrap-up post in July (hopefully I’ll get them done before that though). This time I’ve got a Compact Groceries Tote that I sewed for one of my sisters to show you. About six months ago I got Lisa Lam’s book, A Bag for All Reasons, at JoAnns. The book has 12 different bag patterns, several of which I’ve already got plans to make. 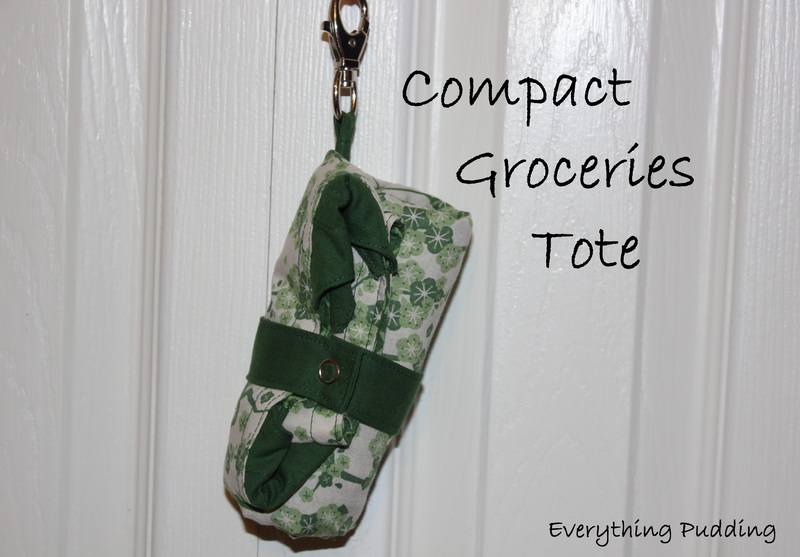 The Compact Groceries Tote is the first bag that I’ve tried out of the book. It was really simple and the instructions and pictures were clear, so I had no trouble putting it together. This bag uses three different fabrics, one each for the inside and outside of the bag and one fabric for the handle. Since I knew the recipient of this bag likes green I picked out three different green fabrics at JoAnns. The only other materials needed was a snap set (had on hand) and a swivel hook. I couldn’t find one that met the dimensions described in the book but found this one at JoAnns which worked well. The pattern pieces for the bags are included in the back of the book. However, because I didn’t want to cut into the paper for fear of losing the pattern pieces, I copied the one pattern piece I needed from the book for this bag onto lightweight interfacing. 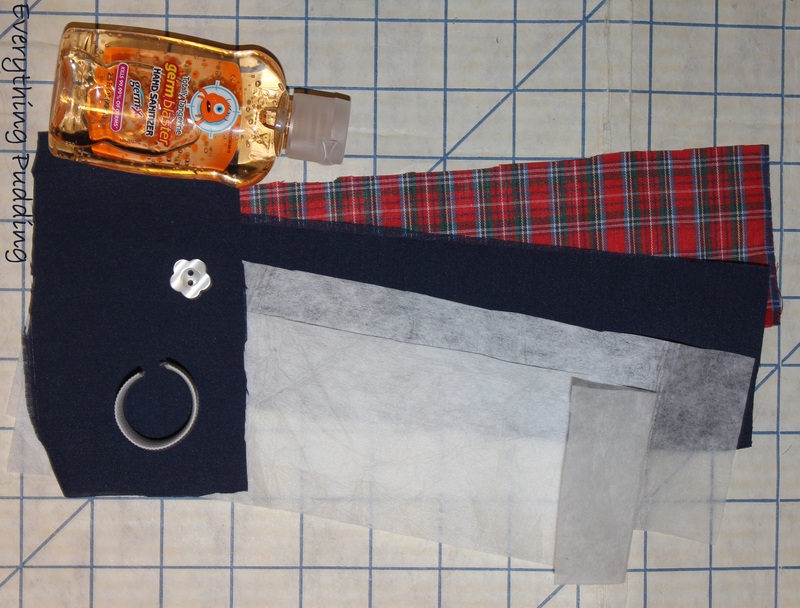 The other pattern pieces that I needed were just rectangles which the book gave dimensions for and I cut out of a brown paper sack. After I had all my pattern pieces cut out it was a simple matter of sewing it up. It was time consuming but it was really easy. The thing I really like about this tote is that it reversible and rolls up. It also has a little swivel hook which is meant to go on the outside so when rolled up you can hook it to something. However, if you put it on the inside (or turn your bag inside out, it’s reversible) you can clip your keys or something small to it. It was an easy tote to make and really fun since I haven’t made very many bags. It’s perfect for a trip to the grocery store or a stop at the library. If you want to make your own Compact Groceries Tote you can do so by picking up your own copy of Lisa Lam’s book, A Bag for All Reasons, grabbing some fabric, and spending a couple hours at your sewing machine. Happy Sewing! Now it’s time for the second Christmas Wrap-up post. This year my sister and I each made something for our Mom’s stocking. She had said before that she’d like some luggage tags so I volunteered to make her some. An elderly lady in our church had given us two large trash bags full of fabric remnants and scraps. We went through and ended up keeping one trash bag full of fabric we liked, we donated the rest. 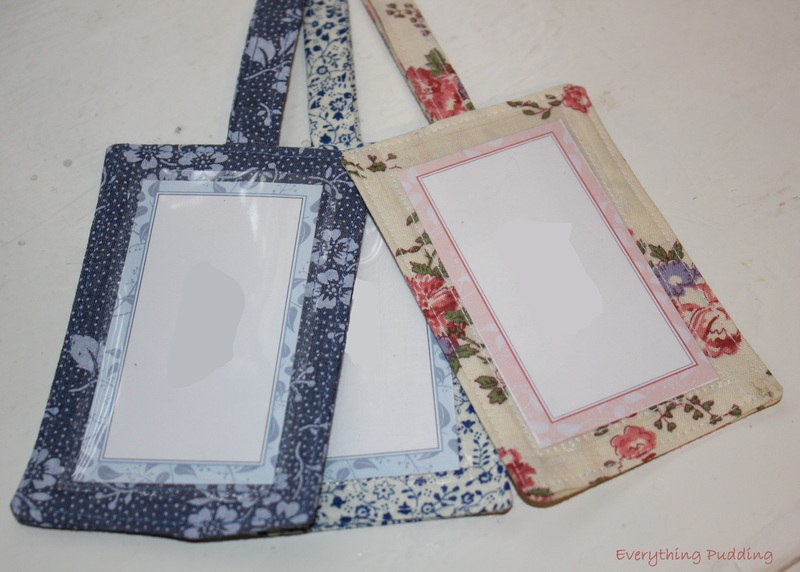 I looked in the bag and found three different cute fabrics that I used to make her luggage tags. 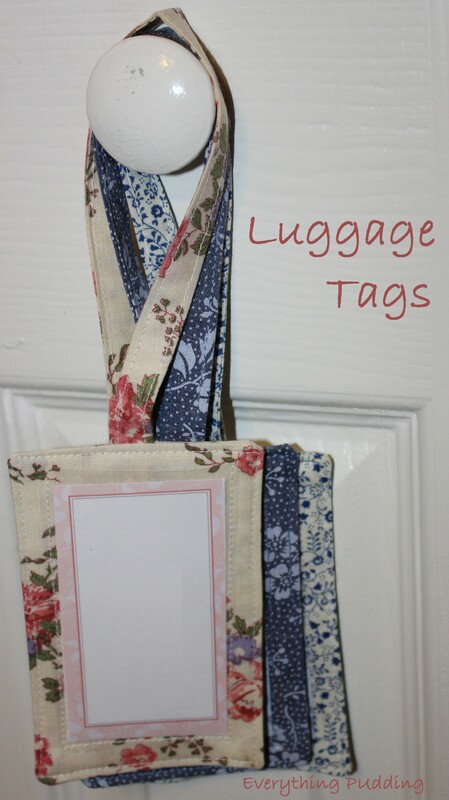 Luggage tags are a great thing to make for a gift. You probably already have plenty of scraps you could use and they are super quick to make. I’d estimate that it takes about 30 minutes to make each one. You can speed up the process by making several at a time. While it’s a lot faster if you’re making them with the same fabric (so you can sew all of them at one time without worrying about changing thread) it’s still faster because you can cut them all out at the same time and fuse the interfacing. So now that you know how quick and easy they are it’s time for you to make some. I used a tutorial from Skip to My Lou which you can find here. 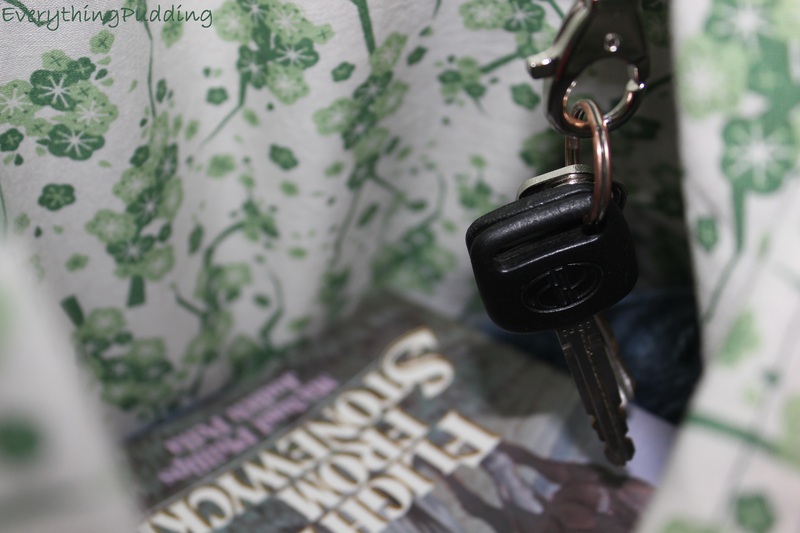 To read more about how made mine (including why I used page protectors for them) read my first post on luggage tags. I am absolutely terrible about finishing projects. But I’ve been finishing some up recently and this is one of them. There are sometimes when I see a cute pattern and I want to make it, even though I have no idea what I’m going to do with it after I’m done. This project was one of them. I saw the pattern in JoAnn’s. It was one of those free tear-off patterns they have in the yarn aisles. I picked it up and added it to the growing pile of patterns to be knitted (well maybe to get knitted). Later when I wanted a new knitting project I picked it up and went to JoAnn’s looking for the yarn. They didn’t have it. Thankfully when I went back a couple weeks later they had it. I got all the yarn I needed for it. I also picked up the needles I needed since I didn’t have the right ones in my stash. I’m really not sure how long it took me to knit the blanket. I picked it up every now and then, during movies or trips. I did eventually finish and when I did I had a whole ball of yarn left. What do I do with it? My little sister was given a “buddy” when she was little and slept with it every night. She gradually got less and less attached as she got older but when she was really little she had to have it. I though I’d look for a pattern for something like it. Her’s had a bear’s head but instead of body it was attached to the center of a mini blanket and had “feet” on all four corners. I was originally thinking of doing a little bear but I found a pattern on Ravelry for a bunny and loved it. I had never made anything with double pointed needles so I wasn’t sure how it would turn out. But it ended up great. It was so fun knitting and seeing the head form and then the ears. The cute little knotted feet on each of the four corners are so fun. My least favorite part of the whole project though was embroidering the face. It took me several tries to get it right but I love how it looks. So know that you’ve read my whole long explanation of how I made mine, here’s some pictures and the details for if you decide to make one. Notes: The pattern calls for size 9 knitting needles but I wasn’t able to find size 9 in the right length so I went up a size and got size 10. It worked fine and the knitting is close enough, no holes or anything. This may have been why I only ended up need 5 balls (600 yards) vs. the 660 yards the pattern called for. I even had enough yarn left over from the fifth ball to sew the hood onto the blanket. Notes: The pattern only called for 105 meters which is 115 yards. I ended up having to buy another ball of yarn because one ball (120 yards ) was only enough to do the blanket portion. I used the new ball to knit the head and didn’t use very much of it. I estimated that I used 150 yards for the project total so plan for somewhere around that. I used a crochet hook to help in picking up the stitches for knitting the head. Because I had never done this I looked up how it was done. I found a blog that had some very useful videos on knitting in the round. View the playlist of the videos here. I was also unsure of what backward loop cast-on was. Found out here. These two projects were so much fun to make, especially the BBF. Bernat Pipsqueak comes in really cute prints so you could create so many different ones. You could also make these out of different yarns. I’m finishing up another baby blanket from a real pretty pattern and am going to make a buddy to go with it. Hopefully that’ll be finished soon! When I started this project I didn’t have anyone in mind to give it to, but by the time I finished it I did. A friend just had a baby girl so I gave it to her. Hopefully she’ll get a lot of use out of it!